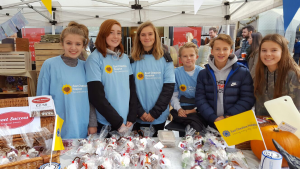 There are lots of different ways that schools can get involved with East Cheshire Hospice, from taking part in our events, to organising your own fundraising activities in your school, to volunteering. We will support you with your fundraising by delivering presentations, attending school assemblies and providing fundraising materials. How does it work? Students are asked to develop a Christmas present for friends and family, retailing at £5 or less. The teams set themselves up as a virtual business taking into account all aspect of business needs. Schools bid for a business set-up loan of £100 in a presentation to Dragons in the Den. All profits made from the programme go to East Cheshire Hospice. Working with your local Hospice is a great opportunity for schools and students to gain an understanding of what the Hospice does, learn about supporting their community, and it is a fantastic addition to any CV, or college or university application. If you’d like to get involved with your school or youth group, whether you’re a teacher, youth leader or student please contact Community Fundraising Team on 01625 664993 or email fundraising@echospice.org.uk to discuss how we can support you.